"Cold Shoulder" artwork and layout by Rachel R. Adler. I won't be able to ride this excuse for much longer, but I've spent the better part of March getting ready for, attending, or recovering from South By Southwest. The world keeps turning, though, even when I'm on my little musical Spring Break; and there are a few things I wanted to share with you even though I may be a little late to the party. Asbury Park-based singer / songwriter, Ella Ross, is working on the follow-up to last year's Uncharted Waters EP. Her sophomore effort, Wasted Youth, is due this summer; and, earlier this month, Ross shared single "Hurt." Ross co-wrote "Hurt." with Tor Miller; and, like she did with Uncharted Waters, Ross went into Asbury's Lakehouse Recording Studios to record the track. The song is expansive, danceable pop rock about moving forward with someone against your better judgment. "Hurt." has a sound that I could see taking Ella Ross pretty far. "Hurt." is available from your favorite digital music outlet. Another Asbury Park band, The Cold Seas, released the video for their single "Retrograde" last Friday. The Cold Seas are Eric Rudic (guitar / keys), Nash Breen (drums), and Chad Sabo (vox / guitar / keys). The band are coming off a string of successes that include a tour with NJ compatriots, Armor For Sleep, a set at Brooklyn's Barclay's Center alongside Deadmau5 and D.R.A.M., and Sabo's production and songwriting work on Rihanna's platinum-selling Anti. "Retrograde" is the first of several singles the band plan to release throughout 2018 as a follow-up to last year's Bad Dreams EP. "Retrograde" is brooding, synth-heavy pop; and the black and white clip directed by Dom P plays right into the song's overall mood. The song deals with longing for the past, and there's a dreamy quality to the video that has moments that play like memories. A Deer A Horse, "Cold Shoulder"
From slick, Asbury Park pop, we turn to jagged, Brooklyn rock. 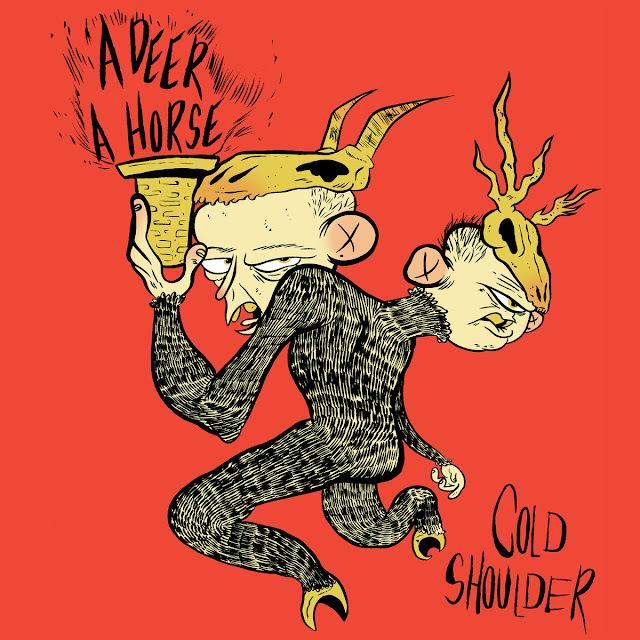 A Deer A Horse are back with a new single "Cold Shoulder." The song finds the trio of Rebecca Satellite (guitar / vox), Angela Phillips (bass / backing vox), and Dylan Teggart (drums) hammering out another artfully aggressive slice of post-punk noise. Confrontational both sonically and lyrically, "Cold Shoulder" builds tension and demands your attention through tempo changes and some off-kilter beats. It's available now over at A Deer A Horse's Bandcamp page as a download or as a limited edition cassingle from GP Stripes.